Funeral Mass for our tertiary Brother Vincent Ferrer (see chronicle). If we love the truth and want to defend it, we must resolutely take our place in the “camp of the truth” whose King is Our Lord Jesus Christ. “To be of the truth” means firstly to know the truth, to study it, and even to contemplate it. If our contemporaries esteem as little the love of the truth, it is because they do not know it. They learn at school lies in science (Darwinism), history (denigration of our Catholic past and exaltation of the Revolution), and especially, philosophy, morality, and religion domains. They are saturated with secondary knowledge that does not develop the mind. Access to the beautiful (which is “the splendor of the true”) is closed to them because the beautiful is found especially in classical literature (English, as well as Latin and Greek), which is no longer widely taught in most schools. Whether we like it or not, we are all more or less marked by this abysmal ignorance. Hence the importance of a real study life is capital. Yes, this means sacrifices: a methodological organization of one’s time, avoiding the loss of time, especially with the modern means of communication that do not form the mind and that keep us from really working (internet, TV, cell phones, magazines, newspapers…). 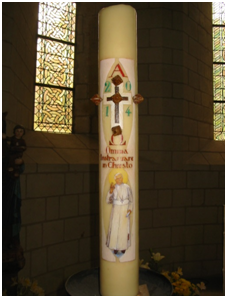 The Pascal candle painted by one of our Brothers. If we desire to know the truth, we must also humbly recognize our ignorance, and learn to take advice from people who are more competent than we are. The truth is received; it does not arise from the depths of our subconscious. One who wants to receive it must be docile. Whoever loves the truth detests error. This is as close to naïveté as to paradox. Yet this disgust for error is the touch-stone by which the love of the truth is recognized. If you do not love the truth, you can say that you love it and even make others believe it to a certain point. But be sure that in this case you will lack the horror for that which is false, and by this sign one will recognize that you do not love the truth. (Ernest Hello, L’Homme, Perrin, 1941, p. 214.) In particular, it is important to examine oneself on the Eighth Commandment (“Thou shalt not lie”). Let us never accept the smallest lie, the littlest calculated ambiguity, especially in the domain of the Faith. Pope Honorius was severely condemned by a Council, and by his successors, for having written an ambiguous letter favoring a heresy to the Patriarch of Constantinople. Solzhenitsyn used to say that the first resistance to Communism was to never accept to collaborate with a lie. Let us flee from the media! They are the kingdom of lies, even if it were only by omission, because they never speak of God. Or if they speak about Him, it is in order to place Him among the miscellaneous events, or to lie abundantly making one believe that all religions honor God. “To be of the truth” means finally to practice the Charity of the truth. Litany of the Blessed Virgin each Saturday after Compline before her statue. Truth is man’s first good. It is truth that delivers him (“Veritas liberabit vos, the truth will set you free.” Jn. 8:32). The Faith (truth about God) gives us eternal life (“The just man lives by faith.” Heb. 10:38). If we truly love our neighbor, we must desire to bring him to the truth. This Charity of the truth spurred on Catholics, especially the missionaries, to the most heroic acts in the times of Christendom. Today, alas! Charity has grown so cold, and one hardly dares to give witness to the truth as did Our Lord “Who came into the world to give witness to the truth” (Jn. 18:37). Let us find once again the zeal of our forefathers. Let us place ourselves resolutely on the “side of the truth.” Let us study it in order to be capable of explaining it, and then let us profess it without fear! It will be for our salvation and that of those who listen to us. Today, more than ever, may it be well understood, society needs doctrines both strong and logical in themselves. In the middle of the general dissolution of ideas, only the assertion, a firm and pure assertion will be accepted. (…) There is a grace attached to the confession of the full and entire faith. This confession, says the Apostle, is the salvation of those who give it, and experience shows that it is also the salvation of those who listen to it. Let us be Catholics and nothing other than Catholics. April 27, the Pope “canonized” Popes John XXIII and John Paul II, the two who are principally responsible for the crisis in the Church. These canonizations are certainly invalid in the eyes of the Catholic Church (see Le Sel de la terre 88). They are false saints put on the altars of the Conciliar Church which separates itself ever more fully from the Catholic Church. May 29, the Pope, Rabbi Skorka and Imam Abu (“friends” of the Pope who accompanied him during his entire trip to Israel) hold arms in front of the “Wall of the Temple”. The amused Jewish journalists who were present will later qualify the trio as “the Blessed Trinity”! The continuation will take place on June 8. In the Vatican gardens, the Pope “prays for peace” with the Jewish and Palestinian Presidents. The Muslim representative does not follow the prepared prayer and asks his “Master” (i.e. Allah) in Arabic: “Give us victory over the unfaithful people.” Two days later Mosul fell into the hands of the Muslims, who massacred the Christians. How much time will be still necessary before the hierarchy of the Church understands the utopia of Conciliar Ecumenism? How much longer will God allow Masonic Lodges to infiltrate the hierarchy? Father Emmanuel Mary, head of the work-site for the future dormitory, inspects the future shower room. Thanks to your generosity we have almost completed the future dormitory for our boys’ school and for retreats, seminars, etc. during vacation times. We, however, beg once again your help because all the bills are not yet paid, and many other projects need to be done as well. In the near future we need to redo the second part of the road to enter our property that we could not do last summer, as well as install a new septic system at our boys’ school (there will be about seventy-five from sixth to twelfth grade this year). Be assured of our daily prayers for both your financial and spiritual support. Mr. Mertens, the father of our Brother Jan Maria, puts up a gutter in order to avoid damaging the recently redone road. April 26: Father Reginald and Father Terence leave for Poitou-Charente for a short camp of the Cadets du Sacré-Coeur, a group of boys formed to spread the Reign of Christ the King. 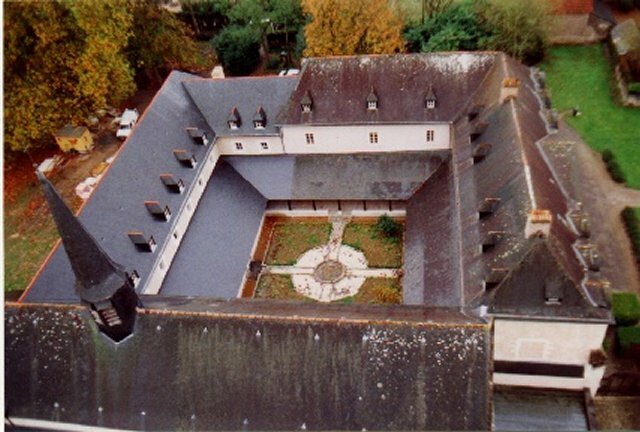 May 11: Father Mary Dominic and Father Hyacinth Mary are in Alsace for a pilgrimage with our tertiaries and for the consecration of the regional Third Order chapter to the Sacred Heart. 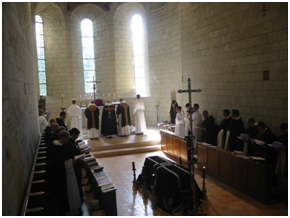 May 13: Solemn High Mass for the funeral of Mr. Philippe Girard, Dominican tertiary, French and history teacher at our boys’ school, and generous collaborator with our review Sel de la Terre. He passed away on May 9 and wished to be buried in the Dominican habit. 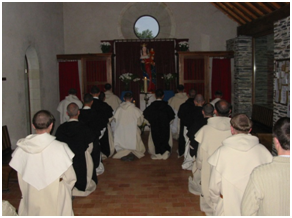 May 24: Father Mary Dominic and Father Hyacinth Mary preside over the pilgrimage with our tertiaries at Paray-le-Monial for the consecration of the south and southeast Third Order chapters to the Sacred Heart. June 7: First meeting for the “Society of Jesus crowned with thorns” in order to promote perfect Christian modesty among women and young ladies. 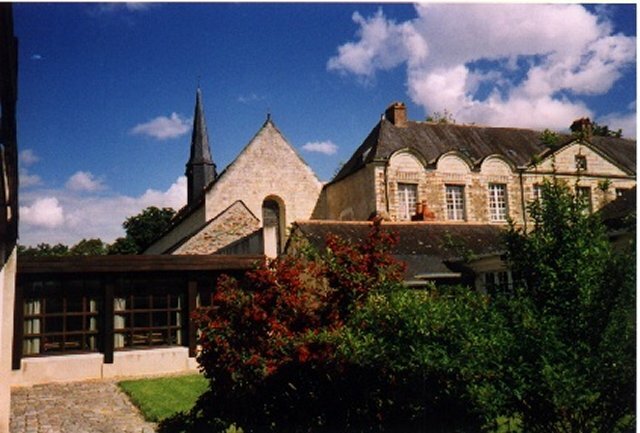 This society was founded in 1878 by Father Emmanuel at Mesnil-Saint-Loup which later on received the blessing of Saint Pius X.
July: During this month, as each year, several Fathers and Brothers organize boys’ camps. We also hold the annual weekend formation on the combat of the Two Cities. Several retreats are preached by our Fathers. Of course the different work-sites at the friary continue as well, and they will last until the end of the summer at least. August 4-12: Our annual retreat is preached to us this year by Father Salenave, U.S.M.L. (Union sacerdotal Marcel Lefebvre – Priestly union Marcel Lefebvre).